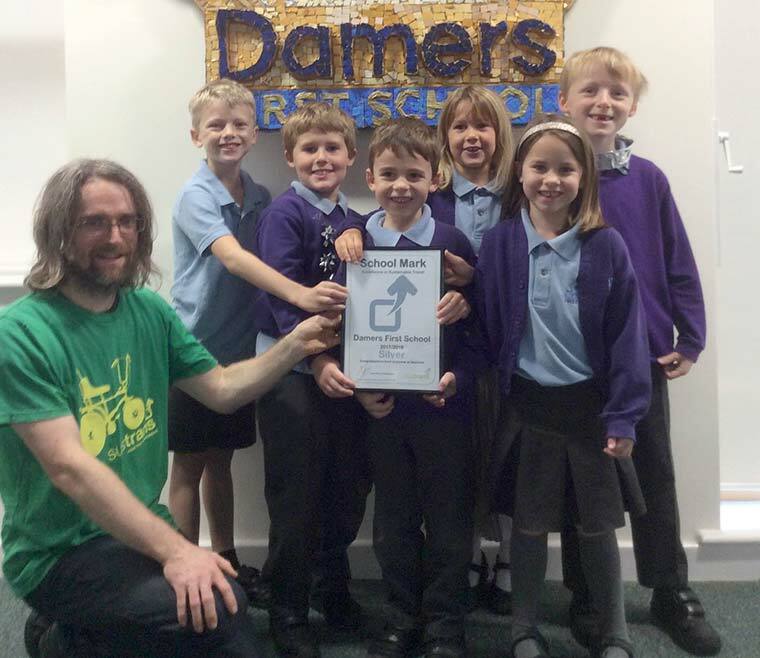 Damers First School has become the first primary school in Dorset to be awarded charity Sustrans' Silver School Mark Award for its outstanding commitment to cycling scooting and walking to school. Sustrans schools officer Jonathan Dixon presented the Sustrans’ silver award to congratulate children, parents and teachers for their efforts in increasing pupils’ cycling levels by transforming the school journey. The school, which recently moved to Poundbury, regularly sees over 50 bikes and over 100 scooters in the shelters. Staff and parents are particularly enthusiastic, with the PTA helping to run many of the school’s incentive schemes and competitions. The Duchy of Cornwall has been very supportive of the school’s initiative, providing prizes for competitions, and helping to install cycle racks. Jonathan Dixon said; “It is fantastic to see Damers First School doing so much to help people cycle confidently and safely. Sustrans works with over 30 schools in the county, in partnership with Dorset County Council to help children overcome the barriers preventing them cycling to school.